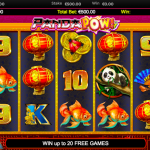 Panda Pow is a video slot game from Lightning Box that was released right after the big success of the Kung Fu Panda movie. The background of the game is painted red and behind the reels we can also see temples and ornaments. The animations and sound effects are remarkably smooth and they bring the game to life. The panda with the red bandanna is the symbol with dual function. It can act as a wild and it appears on the second, third and fourth reel. Its function as a wild is to stand in for every other symbol to complete a winning line. The same symbol can act as a scatter as well and you need to land 5 symbols for 5 free spins, 6 pandas for 8 free spins, 7 pandas for 12 free spins, 8 pandas for 15 free spins and 9 pandas for 20 free spins. 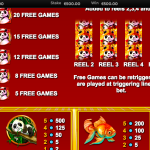 During the feature a new symbol, the wild golden panda is added to all the reels except the first one. This will really help you land some good wins. 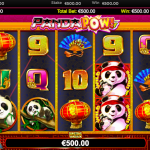 Panda Pow is one high quality video slot game on the market. But then again we would not expect anything less from a game that comes from Lightning Box. The first thing that we noticed was the beautiful graphics and the sound effects. But what kept us coming back for more were the special symbols and features that at some point can make the game play so thrilling. So be prepared to be at the edge of your seat throughout the whole session. Another thing that we really appreciate in a game like this one is the fact that the betting options are so wide so every kind of a player can find the right bet size for them. For another great engaging slot you should consider playing Mild Rockers a 6 reel slot by Lightning Box.